Jan. 31, 2015 – After tying Trabuco Hills in South Coast League dual matches with a record of 3 wins and one loss, Laguna Hills won another League Finals tournament to extend their California record to 28 consecutive championships. The streak began in 1988. For the first time, it was a Coast View Conference tournament that included the five high schools from the South Coast League wrestling against the four schools from the Sea View League. Laguna Hills led with five individual champions in the 14 weight classes. They were (left to right) Dominic Larraga (184 pounds), Titus Azad (128), Dexter Vienvilay (108), Phillip Zamora (140) and Anthony Le (115). The last three were also league champions last year. Hawk junior heavyweight Brian Millan was another league champion since his only loss was to a wrestler from Aliso Niguel of the Sea View League in the finals. San Clemente had four individual champions, but they finished third behind league rival Trabuco Hills which had only one weight champion but matched Laguna Hills with 12 qualifiers plus an alternate for CIF Individual Championships to be held at Ayala High School in Chino Hills on February 20-21. Matt Pascual (122), James Oliveros (147), Isaiah Roe (154) and Alex Delacruz (172). Edgar Ayala was fourth, but ranked third among league schools. Cody Scott (162) placed fifth, but he was fourth among league teams so he still advances to CIF competition. Juan Paez (134) finished sixth, so he will be an alternate at CIF. Dana Hills was fourth among South Coast League teams with 11 CIF qualifiers, and Mission Viejo placing fifth with three qualifiers. 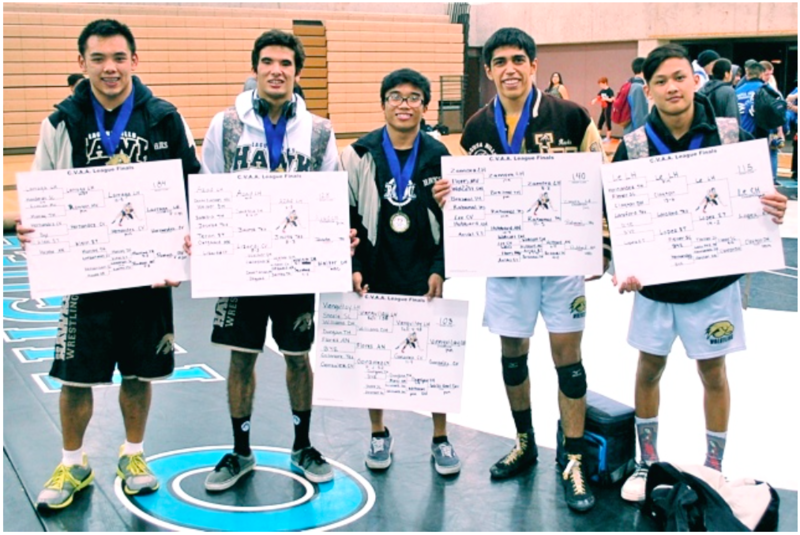 Aliso Viejo was the best Sea View team with three individual champions and seven CIF qualifiers plus four alternates. Capistrano Valley had one champion and seven qualifiers, Tesoro had five qualifiers plus two alternates, and El Toro had four qualifiers plus three alternates. 108 Pounds: 1- Viengvilay (LH), 2- Gonzalez (CV), 3- Williams (DH) 4- Dungan (TH). 115 Pounds: 1- Le (LH), 2- Lopez (ET), 3- Clayton (DH), 4- Flener (SC). 122 Pounds: 1- Hernandez (CV), 2- Roxas (TH), 3- Pascual (LH), 4- Aldrette (DH). 128 Pounds: 1- Azad (LH), 2- Jacobs (TE), 3- Walker (DH), 4- Sarabia (TH). 134 Pounds: 1- Lozano (AN), 2- Manoukian (DH), 3- Ward (TE), 4- Jarmen (TH). 140 Pounds: 1- Zamora (LH), 2- Rabanal (TE), 3- Hubbard (AN), 4- Brazeal (TH). 147 Pounds: 1- Sarabia (TH), 2- Curry (CV), 3- Oliveros (LH), 4- Fiegner (SC). 154 Pounds: 1- Meisinger (SC), 2- Gonzalez (AN), 3- Roe (LH), 4- Wharton (TH). 162 Pounds: 1- Marshall (SC), 2- Youssef (CV), 3- Howa (TH), 4- Drummond (DH). 172 Pounds: 1- Marshall (SC), 2- Frantzen (ET), 3- Delacruz (LH), 4- Occhipinti (TH). 184 Pounds: 1- Larraga (LH), 2- Hernandez (CV), 3- Roman (MV), 4- Murray (TH). 197 Pounds: 1- Ames (SC), 2- Montes (AN), 3- Clemente (DH), 4- Ayala (LH). 222 Pounds: 1- Hateley (AN), 2- Garcia (TH), 3- Plumb, 4- Nixon (ET), 287 Pounds: 1- Corona (AN), 2- Millan (LH), 3- Hernandez (MV), 4- Carrillo (TH).